I was reading Chris Low’s ESPN oral history of the 1997 Heisman Trophy race that still engenders arguments over whether Michigan defensive back Charles Woodson really did deserve to win over Tennessee quarterback Peyton Manning. However, one line, spoken by Washington State quarterback Ryan Leaf, also a finalist that year, struck me more than anything else. He said: “We showed back up at the Downtown Athletic Club at 2 or 3 in the morning, and all the former winners were around the piano singing songs.” It stopped me in my tracks. I did not even finish the article. How could I? How could I possibly do anything but envision a movie? The emergent question, of course, becomes what type of Heisman winners would surround our finalists? Luckily for you, we have some ideas. Steve Spurrier-type. The ol’ Ball Coach, particularly as he has aged and seemingly lost interest in the sport, exudes a smart-alecky nonchalance that would mark him as the Statler & Waldorf of the proceedings, drinking Coors, cracking wise, getting bleeped on ESPN. Tim Tebow-type & Ricky Williams-type. Tebow is a staunch Christian and Williams is a cannabis advocate! And hey, what wacky comedy doesn’t peddle in obvious, terrible stereotypes?! These two could be The Downtown Athletic Club Odd Couple! Hijinks!!! My God, the hijinks!!! Eric Crouch-type. 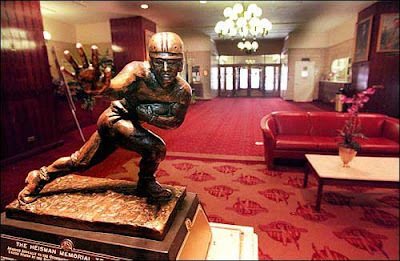 Crouch, formerly of my beloved Nebraska Cornhuskers, parodied himself a couple years ago as an egotistical Heisman winner resting fiercely on his laurels, and so why not take that parody and twist it, turning the Crouch-type into the scraggly ex-Heisman winner who, having fallen on hard times, is now living at the Downtown Athletic Club, causing comic mayhem at every turn? Doug Flutie-type. Our apologies to the former Boston College quarterback, an irrefutably deserving Heisman winner and a seemingly genuinely good guy, but something about his visage suggests him for the part of Downtown Athletic Club’s Dean Wormer, authoritatively defending the Heisman Trophy’s honor, scheming to keep that rule-flouting Reggie Bush out, dealing with that scruffy Eric Crouch’s antics. Gino Toretta & Andre Ware. Neither of these quarterbacks from Miami and Houston, respectively, really should have won their Heisman Trophies and I dare say they both know it. And that is why they would spend the entire day in “Do-Deca-Pentathlon”-ish escalating feats of strength. Johnny Manziel-type, and Jason White-type & Carson Palmer-type. Johnny Manziel is Biff Tannen, Jason White is 3-D and Carson Palmer is Match, the Heisman Trophy winner gang that goes around bullying the newbie nominees. Vinny Testaverde-type. Like Jerry O’Connell in “Can’t Hardly Wait”, the Vinny Testaverde-type will appear like an apparition near the end, unshaven and in a tux with the necktie and collar loose, warning that year’s victor that being a Heisman Trophy winner and #1 NFL draft pick are not necessarily all they are cracked up to be.